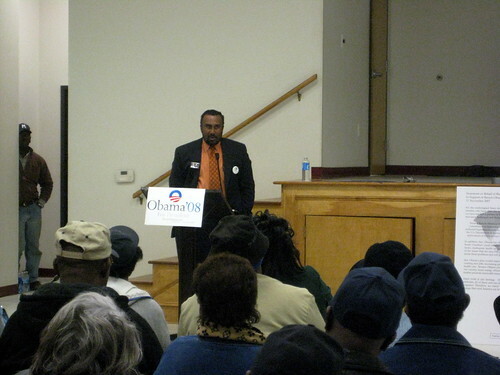 Just a couple of hours after Congresswoman Moore's visit to Florence, the campaign held a town hall meeting with farmers and their families in Kingstree, SC about Senator Obama's commitment to support rural communities in South Carolina, including black farmers who have been discriminated against by the U.S. Department of Agriculture. 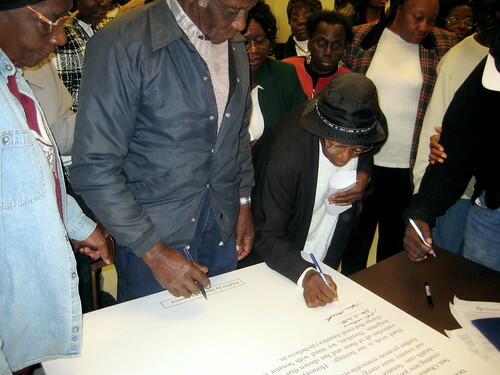 In addition to Representative Moore, speaking at the forum was farmer, prominent Barack supporter, and former candidate for SC Commissioner of Agriculture, Emile DeFelice; Dr. John Boyd, President National Black Farmers Association; and Mike Strautmanis, who helped Barack author the Senate legislation designed to protect black farmers from USDA discrimination. 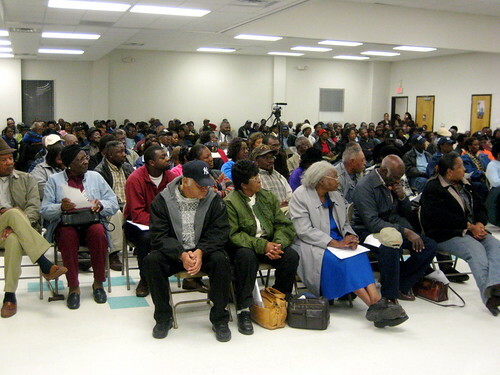 The forum was absolutely packed with folks from Kingstree, the vast majority of whom, at Dr. Boyd's request, indicated that themselves were farmers. 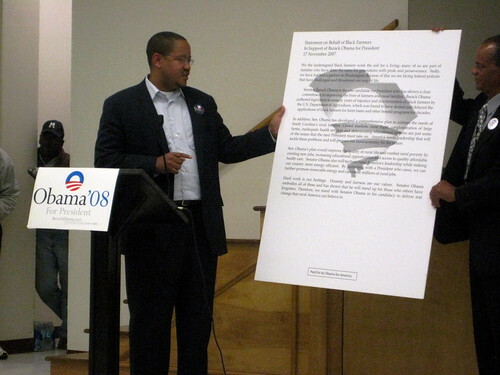 During his presentation, Dr. Boyd talked about his support for Barack being rooted in the lengths Senator Obama and his staff had gone to defend the rights of minority farmers. This sentiment was buttressed, by former Senate staffer, Mike Strautmanis, who helped Senator Obama write the law he has put forward to protect black farmers and who got a little emotional when talking to the people in Kingstree the law would be helping. "We wrote the bill to provide [farmers, like you] with relief that you [need]. Not because of anything in [our] background, but because as I look across this room I see my parents, I see my friends, I see my uncles, I see my grandparents, I see my people. So I knew we had to do what's right. I came by here to tell you one thing and one thing only: When Barack Obama is President of the United States you don't have to worry about this bill. He will sign it into law, no question about it. We will work every day, for this day to that day, to get you the relief you deserve." After the discussion, dozens of the farmer's in the room signed on to support Barack because of his strong commitment to improving the options and opportunities available to South Carolina's rural communities.